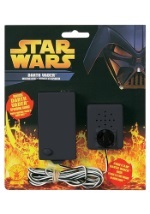 Be fully equipped to handle the Dark Side of the Force with these child Darth Vader gloves. The accessory comes in black faux leather and has detailed stitching along the exterior. Plus, the one size fits all gloves have a soft polyester interior. Complete your Darth Vader costume with these officially licensed Star Wars gloves and browse our other Darth Vader accessories.